Here are some suggestions for classic Irish fashion accessories for men, whether Irish or not, but who appreciate well made, tasteful items. Some people would have us believe that men are difficult to buy gifts for - but these unusual gifts all have a strong Irish connection that will make a great statement for those special occasions, birthdays, Christmas and on St Patrick's Day - or any special day for that matter! If you'd like to give a male friend or relative a very special gift that whispers 'quality' with an Irish lilt - then here are a few unusual items. 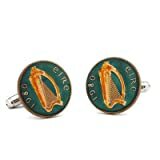 These are sure to encourage the men in your life to enjoy 'the craic' in style! I think cufflinks are the finishing touch on a man's shirt - and also on a woman's blouse or shirt - and are an elegant detail that's often missing on today's garments. 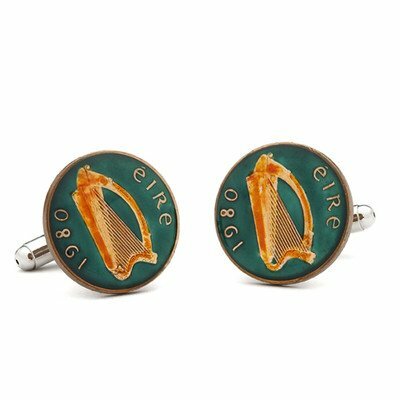 Here's some cufflinks with an Irish slant. They make an unusual yet practical gift. There's something about Irish Tweed that gives a beautifully rich, bespoke feel to a garment or accessory. Just a small simple item, such as a scarf or tie is all you need to add an aura of luxury to the whole outfit. Good material, well made by craftspeople, hangs or sits well too. Irish Tweed falls into this category. Items are usually hand-made by people with experience and reverence for the material they are handling. An Irish Tweed accessory is a small, but luxurious item that speaks volumes about the man you are giving it to. It says he is a class act! Handmade from Irish herringbone wool tweed. Right on Trend This Season! If it's good enough for Justin Timberlake, Brad Pitt, Damien Lewis, John Hamm and The Arctic Monkeys then rest assured, it'll be good enough for the man in your life! Check out the look here! Apparently sales of the flat cap are soaring with such celebrity endorseent! Two Fairtrade Unisex 'Spinning' Rings are shown below. Legend has it that silver spinning rings were originally worn to calm down the wearer, reducing anxiety and tension. The idea is to play with the spinning ring, spinning one band around the other, and the movement is said to reduce tension and calm the spirit. So if there's a man you know who is suffering from 'high anxiety' this could be the perfect Irish gift! A handkerchief tucked into the breast pocket of an Irish Tweed jacket is another subtle, quality touch. 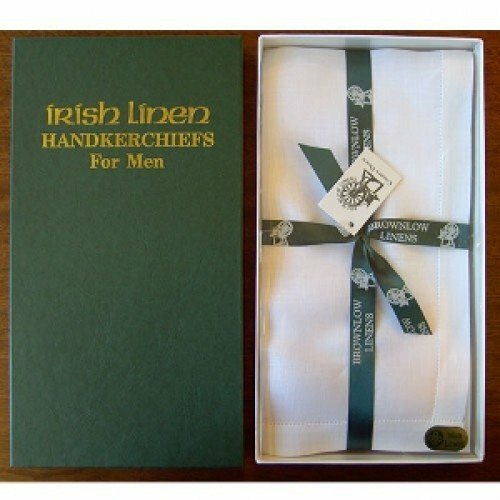 These beautiful handkerchiefs are made in Lurgan, County Down, Ireland and the company, Thomas Ferguson, have been making quality Irish linen since 1854. It's just another classy little touch that makes all the difference between pulling out a tissue or producing a gorgeous hemstitched Irish linen handkerchief! It's a sad fact that smart phones are taking over every practical function in modern life - so that the craftsmanship of even the simplist watch seems to go unappreciated. 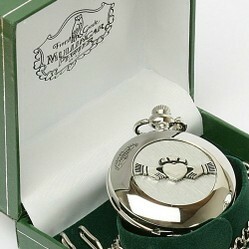 But here is a beautiful vintage-style watch to remind us that time is precious! 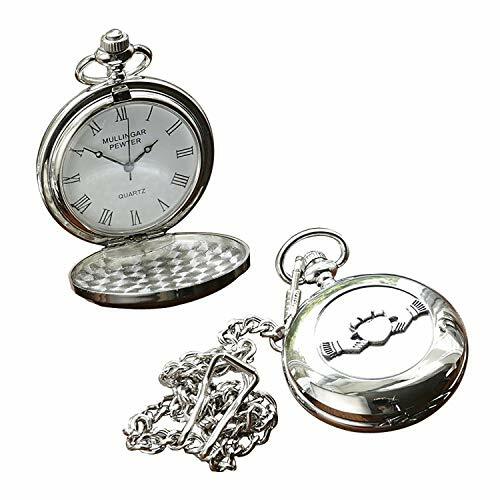 This elegant time-piece is hand-made in Ireland by Mullingar Pewter and incorporates the three parts of the claddagh design - the heart, clasped hands and the crown - together they represent love, frienship and loyalty. This is surely a fitting symbolic fashion accessory for a dear male friend or relative. And the Finishing Touch - A Drop of the Hard Stuff! We mustn't forget that it's all very well looking smart and sophisticated, but let's not forget that no respectable Irish gentleman would be seen without a hip flask for the Jamieson's Whisky! Whilst not of Irish manufacture, I chose this hip flask because of it's beautiful, classic shape - and also the window incorporated into its design. This means you can see whether you need to top up your precious cargo. You can choose to have a personalised engraved message on the side too, if you wish. These are just a few ideas for classic gifts for the man or men in your life. They are a little bit special - just like him. My favorites are the shirt cuffs and the hip flasks. Great gift ideas, Kathleen!! P.S. Pinned some of them. These are beautiful, and the article is just perfect for my all things Irish board. London’s St Patrick’s Day Parade is a massive party which embraces all sections of the community. This year's theme is 'The World of Dance'! Take a guided walk around Mayfair and follow the brilliant Irish author, Oscar Wilde as he stops off at his club, visits his tobacconist and shops for green carnations.